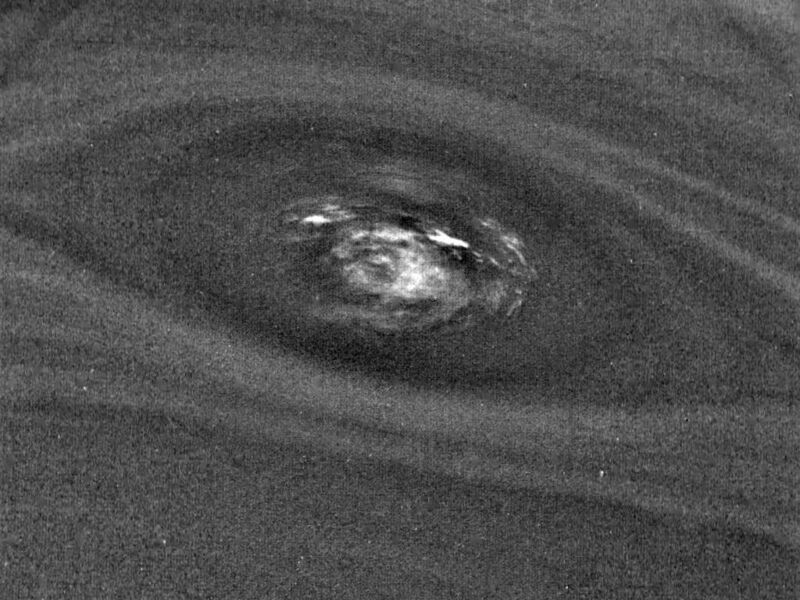 This bulls-eye view of Neptune's small dark spot (D2) was obtained by Voyager 2's narrow-angle camera on Aug. 24, 1989, when Voyager 2 was within 1.1 million km (680,000 miles) of the planet. The smallest structures that can be seen are 20 km (12 miles) across. 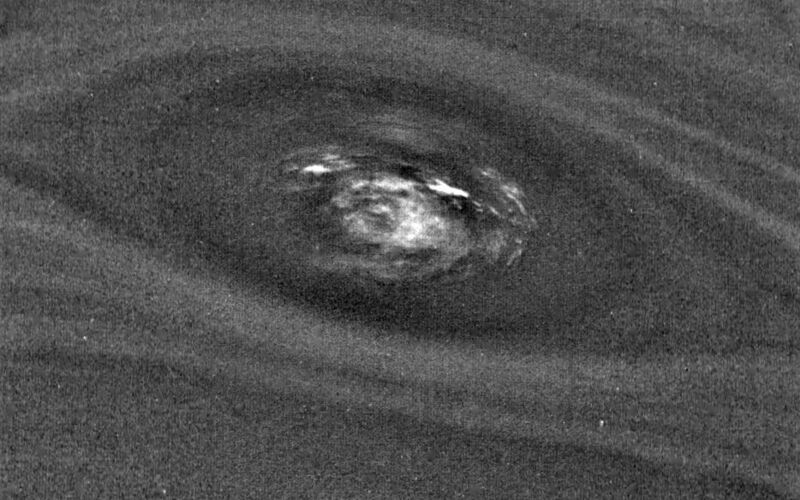 This unplanned photograph was obtained when the infrared spectrograph was mapping the planet, and is the highest resolution view of the feature taken during the flyby. 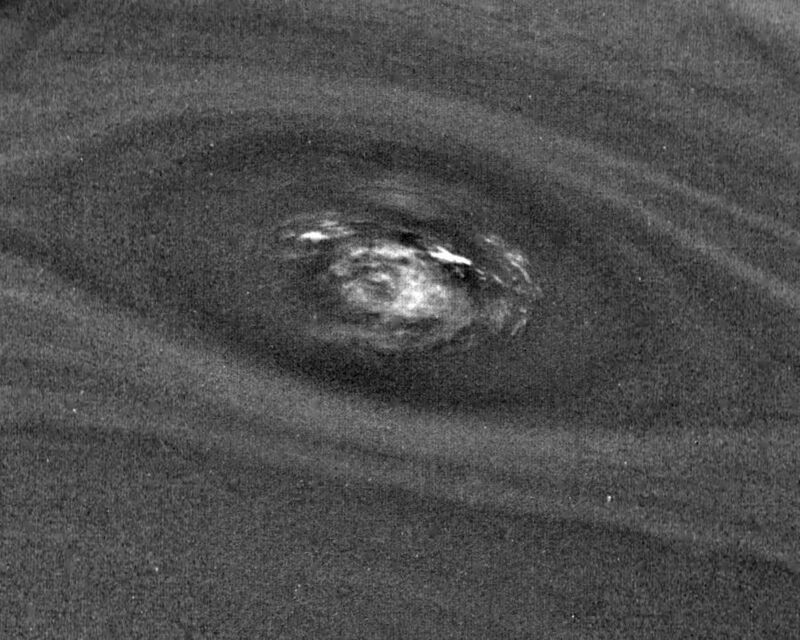 Banding surrounding the feature indicates unseen strong winds, while structures within the bright spot suggest both active upwelling of clouds and rotation about the center. A rotation rate has not yet been measured, but the V-shaped structure near the right edge of the bright area indicates that the spot rotates clockwise. Unlike the Great Red Spot on Jupiter, which rotates counterclockwise, if the D2 spot on Neptune rotates clockwise, the material will be descending in the dark oval region. The fact that infrared data will yield temperature information about the region above the clouds makes this observation especially valuable. The Voyager Mission is conducted by JPL for NASA's Office of Space Science and Applications. On Aug. 25, 1989, NASA's Voyager 2 made its historic flyby of Neptune and that planet's largest moon Triton. The Cassini mission is publishing this image to celebrate the anniversary of that event. NASA's Voyager 2 spacecraft flew by Triton, a moon of Neptune, on August 25, 1989. 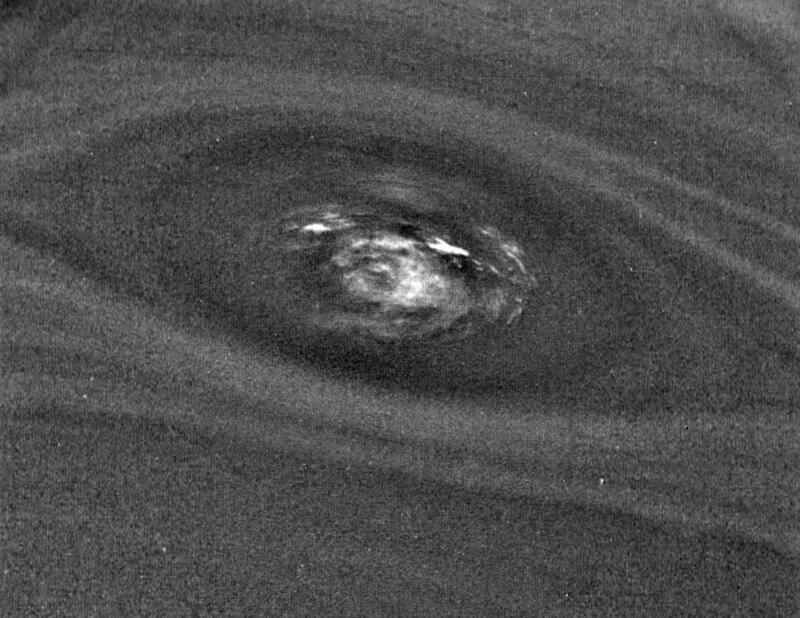 This frame from a video using Voyager data recreates that exciting encounter. NASA's Voyager 2 spacecraft flew by Triton, a moon of Neptune, in the summer of 1989. Dr. Paul Schenk, a scientist at the Lunar and Planetary Institute in Houston, used Voyager data to construct the best-ever global color map of Triton.